I often watch Television just to see the fashions worn in weekly dramas and sitcoms. I have been drawn to the CBS political drama, Madam Secretary. Tea Leoni plays the Secretary of State, Elizabeth McCord who advises the President and is clearly the brains of the operation. 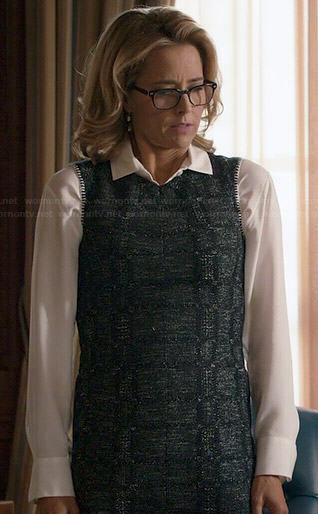 I love the subtle sophistication of Elizabeth's wardrobe and find myself looking forward to each week's episode just to see what she is wearing. On more than one occasion she has worn what I would call a "jumper sheath" with a tailored blouse. I found myself thinking .... "I like that look; I want to wear that look; I can make that look........"
I chose a polyester/rayon (feels like light weight wool) houndstooth suiting that I found at JoAnn Fabrics. I lined it with a polyester lining. I used a simple sheath pattern, used previously, so I knew it would fit perfectly.